Do you ever feel like you have so much to do so instead of doing any of it you go take a nap? I feel like it is happening. Every year at about this time I start feeling overwhelmed. and final tests are looming. The weather is nice and begging you to skip class and play outside. crafting and re-crafting resumes and cover letters and applications. I have been stressed about interviews and our summer plans. There is just so much to do and I am feeling overwhelmed. Then I found this quote on a friend's blog. 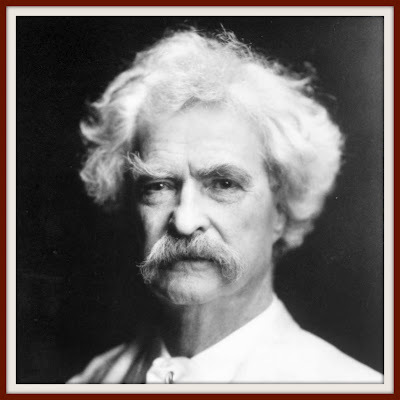 It is by Mark Twain. "The secret to getting ahead is getting started. The secret to getting started is breaking your complex overwhelming tasks into small managable tasks, and then starting on the first one"
For some reason, this just clicked. One task, just do one small task, check it off your list and then move on to the next. I am just going to do a little at a time until everything is done. Thanks Mr. Twain, you are so wise. This quote on sticky note on desktop...CHECK! I have the problem of wanting to nap and really needing one, but knowing that I have work to do. Usually I should have taken the nap while I could have, but I always end up working and being really really tired. Oh, how I needed to read this this morning! I'm at that point in the semester too where I'd like to just curl up in the fetal position and cry. One. Step. At. A. Time. love twain and love that quote. Love the quote! I need to put it on a sticky note on my desk as well! :] And seriously, the wonderful weather really does BEG you to skip class! GAH! I love this. I have ADD and it is SO hard for me to focus on one thing at a time! I'm gonna try though...!! Ugggghhhhh.... my stomach literally groaned outloud in pain when I read that you were working on resumes over and over again... that would be something that I LOATHE ENTIRELY. I commend you for your hard work! haha :) And I definitely love that quote! I totally get overwhelmed and just take a nap or watch a movie or something and then am stuck cramming everything at the last minute! girl I do that ALL the time. Sometimes our bodies just need a nap :) a little break! The quote above is brilliant! So tue! i get like this a lot. love your blog. found you via breakfast at the zemkes! Mark Twain is a genius. Simple as that. And I really needed that little kick in the pants of a quote for I too am being run down by finals week approaching. what a perfect quote. it's so simple and yet so true. i hope you are maintaining some sense of calm!! Liebster, not to be confused with Lobster.